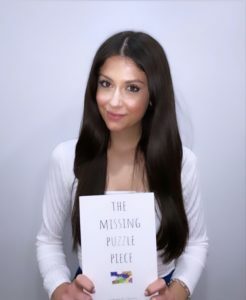 The Missing Puzzle Piece is a wonderful new book for children, written by one of Gateway’s very talented and passionate therapists, Lisa Zora. The message of the book is both universal and inspiring and will especially resonate with parents of children with special needs. The heartfelt story of a parent’s search for a missing puzzle piece symbolizes for the reader the parent’s journey, which ultimately results in discovering with their child a deep source of love, meaning, and fulfillment. You can learn more the story and purchase your very own copy by visiting these fine book retailers: The Missing Puzzle Piece is currently available in paperback at Barnes & Noble and Amazon, where it holds an outstanding 5-Star rating. We encourage you to read this book and share with loved ones! Lisa Zora joined Gateway after completing her undergraduate degree in Biology at Oakland University. In addition to her work providing direct ABA therapy and supervision to her clients, Lisa is nearing completion of a master’s degree in education with an ABA concentration through Arizona State University. Everyone at Gateway is incredibly proud of Lisa and fortunate to have her as part of our team. The Missing Puzzle Piece, like her work with children on the autism spectrum, is testament to Lisa’s caring nature and her passion for helping others.